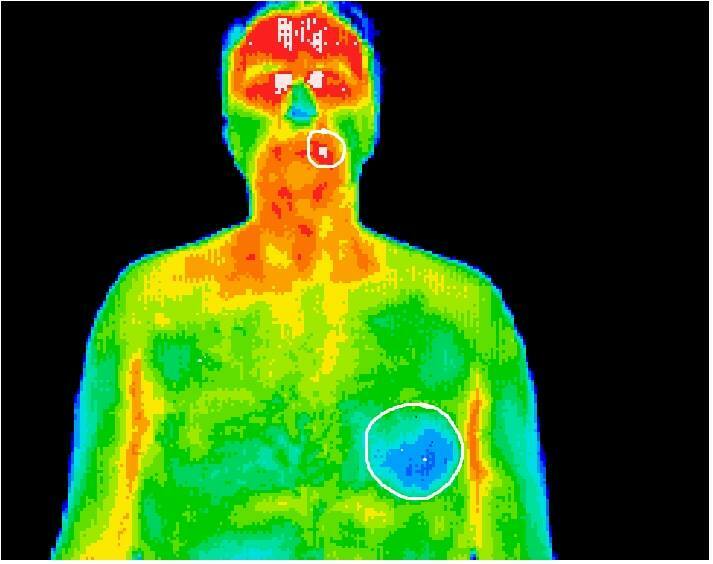 “Thermography measures the temperature of the breast and there is no need for any mechanical pressure or ionizing radiation.” – John Gofman, MD, nuclear physicist, & one of the worlds leading experts on radiation damage. This is a comparison of my thermography’s done in 2008 and 2016. I’ve been doing thermography scans since I was 17 years old, never once have I had a mammogram. When I posted this photo on my instagram, this post alone got the attention of over 6,000 people. I was astounded at the number of people who had never even heard of thermography! 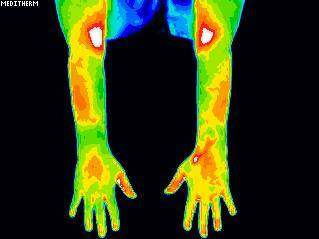 Thermography’s been around for about 30+ years and has thousands of peer reviewed studies, proving its efficacy as a safe and effective screening tool. 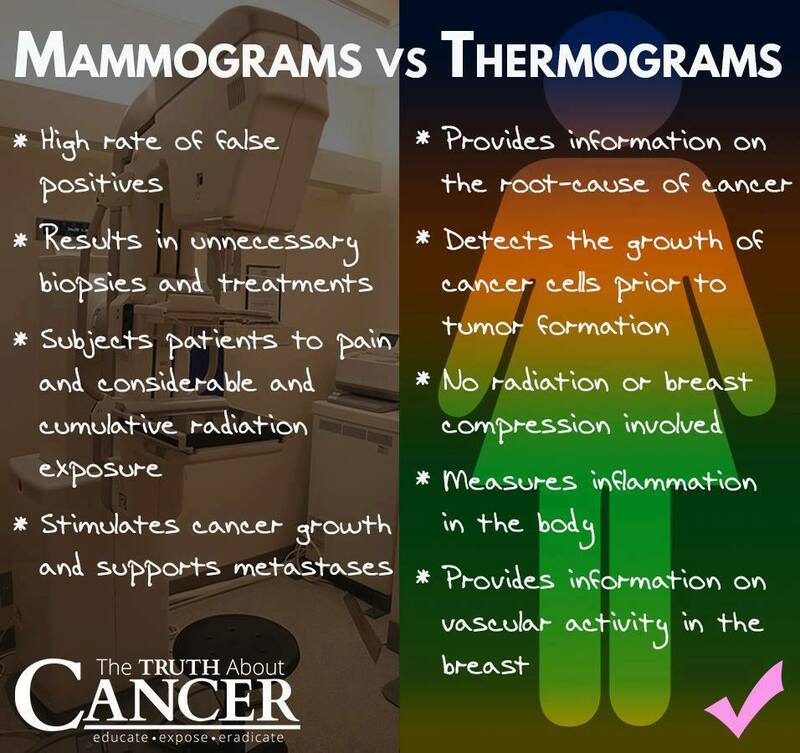 Not only is thermography able to detect breast cancer years earlier than mammography, but it can detect ANY inflammation in the body ANYWHERE. Inflammation is the beginning of disease and imbalance. Once we can identify the area of dysfunction, we can pin point how to heal it through functional medicine. Mammograms squish and compress your breast, shooting radiation into the breast – which raises the risk of breast cancer by 1% for each mammogram that is had. With thermography, there is no compression or radiation – nothing touches you. It is a digital infrared camera that takes a picture of your body heat. 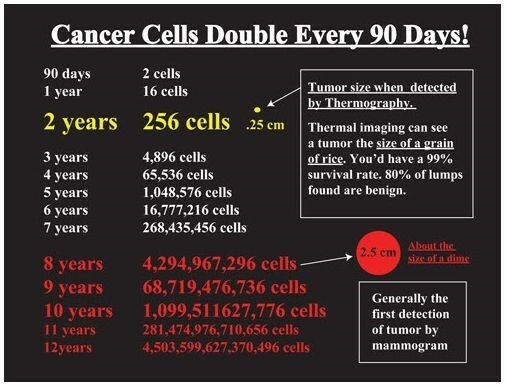 The reason why I can claim that Thermography IS early detection and ACTUALLY PREVENTATIVE is because cancer is detected when it has only multiplied to about 256 cells. Whereas with Mammography, cancer is detected at over 4 BILLION CANCER CELL. At this point, this is not even preventative. This is just telling you that you have a tumor. “Active breast cancer cells double every 90 days, causing inflammation, which is our body’s physiological response to this abnormal process. Our immune system has failed… from either an acidic environment caused by poor nutrition, too much estrogen, hormonal imbalance, or genetic pre-dispositions that are triggered by our own diet and lifestyles. Abnormal vascularity will begin in the breasts in order to feed, nourish, oxygenate and support the growing tumor. This all takes place at under 300 cancer cells. 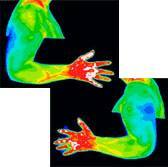 This is when thermography can see those changes that are taking place. OR, you could do your typical conventional standardized “gold standard” tests, and wait until you have over 4 BILLION cancer cells in that tumor, when a mammogram will finally see it. If you have tenderness and pain in the armpit area, you may have lymphatic congestion. The lymphatic system runs from your brain to your toes & is like your body’s sewage system. If you are congested, you are not ridding your body of toxins! This system requires movement to get the sewage circulating out of the body. When there is stagnation, there is congestion in the lymph nodes (such as in the groin, under arms and sides of the throat). Often times the tumors that are removed from breasts contain the same chemicals as in deodorants. Lymphatic massage is amazing and can really help to clear up congestion within a few sessions. I recommend Fia – Fia@Metta-Massage.com. Drinking half your body weight in ounces of pure water each day. Water helps your body to flush out toxins more easily. Exercise stimulates the lymphatic system to move all the sewage and excrete it out. It also makes you sweat, which helps to release toxins. Inflammatory Breast Cancer is the most rare and deadly form of all breast cancers. Unfortunately, it is also still widely unknown of all breast cancers too. There is usually NO palpable tumor with IBC. Can you imagine this woman doing a mammogram? Squeezing and compressing her completely inflammed breast? IBC spreads and metastasizes like wild fire and will not be touched by doctor unless forced to do chemotherapy first. 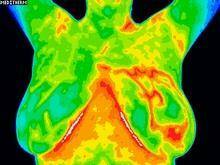 Thermography is the ONLY imaging modality that can see IBC in its most earliest stages. Stroke happens when the brain is deprived of blood. What carries the blood to the brain? The carotid artery. The carotid artery is the largest vessel that supplies blood to your brain. If there is inflammation/blockages, it can result in a stroke. 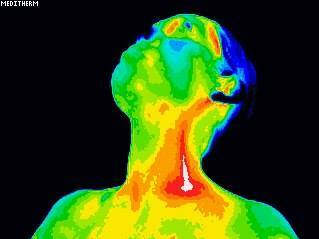 Thermography can show you inflammation in the carotid artery years before it becomes a stroke. This person has a huge risk factor for a stroke because of this inflammation in their carotid artery. After detoxing and supplementation, her thermography returning to normal. This is precisely why you it is vital to return for your 3 month follow up. Because cancer cells double every 90 days! This woman thankfully did her 3 month follow up and was able to catch her abnormal/suspicious activity before it turned into cancer. This patient with a hypothermic asymmetry over the left lower chest has a history of coronary heart disease (CAD) . He also has an abscess at the upper left tooth. Gum disease can raise your risk of a fatal heart attack up to 10 times. According to Dr. Curatola, if you get a heart attack related to periodontal or gum disease, nine times out of 10, it will actually kill you. The green circle just below the neck signals a good, balanced functioning immune system. The blue/cool spot below the neck signals an immune imbalance or weakened immune system. Through blood work you would be able to tell exactly what it is. Two different people with diabetes and diabetic nerve pain. The white and red spots are the most inflammed. Mammograms are NOT early detection, nor are they prevention. They are detection once you have a tumor. How many women do you know who gets their mammograms faithfully every year and then have the nasty surprise of being diagnosed with breast cancer? How many women get their mammograms and it misses their cancer? Thermography sees the physiological process of cancer….inflammation, vascular changes, pattern changes, blood vessel development – which precede and support active tumor growth. Ditch the chemical deodorant ! Thank you for educating on thermography. I had my first full body scan 6 weeks ago, I have received the report but I’m looking for someone to go over the findings with me. I’m in the Memphis,TN area and there is no local that I’m aware of, so I’m looking for any guidance. I know the report has valuable information, but I am overwhelmed about what it means for my lifestyle & prevention. Hey there, if you search online for a functional medicine doctor in your area that would be a good place to start.